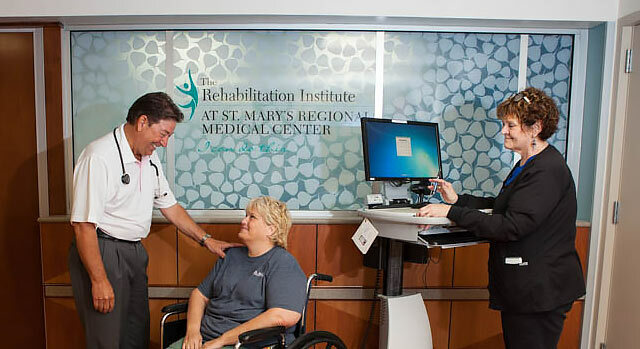 The Rehabilitation Institute at St. Mary’s Regional Medical Center offers comprehensive inpatient rehabilitation services for people with brain injury, stroke, orthopedic, neurologic and other conditions that require rehabilitation in the hospital prior to discharge or following an injury or illness that was treated at St. Mary's or elsewhere. The St. Mary's Rehabilitation Institute has received the following three accreditations from the Commission on Accreditation of Rehabilitation Facilities (CARF), which recognizes a program's quality, transparence and commitment to patient satisfaction: general inpatient, brain injury inpatient and stroke inpatient rehabilitation. For more information, please call us at 580-548-5001. Brain injury can result in a wide range of physical, mental and personality changes. The brain injury program at the Rehabilitation Institute is designed to help people with a brain injury achieve maximum recovery by providing intensive interdisciplinary rehabilitation services designed to minimize or prevent chronic disability. The program provides treatment to restore optimal levels of physical, cognitive, behavioral, social and emotional function based on a plan of care specifically designed for the needs of each patient. The brain injury program is designed to help people with a variety of brain injuries, with a special emphasis on brain injury resulting from trauma. Traumatic brain injuries can occur when a head injury damages the brain and are most frequently caused by motorized vehicle crashes or falls. The Rehabilitation Institute Medical Director, a specialist in rehabilitation and brain injury management, will provide medical care and lead the team in guiding the treatment plan. Program services are provided by the following specialists who come from a variety of hospital departments. Nurses trained in the special needs of brain injury recovery will provide 24 hour care under the supervision of the Medical Director and other physicians involved in the care of the patient. They will assess and develop plans of care for bowel and bladder dysfunction, medication management, skin care and other areas of disease management. Rehabilitation nurses will also help patients use skills learned in therapy activities during the rest of their day. Physical therapists focus on training to improve balance, transfers, mobility and strength, including the use of mobility devices, if necessary. Occupational therapists focus on treatments to improve activities of daily living including eating, bathing and dressing. These therapists also have training to treat dysfunction and injuries involving the upper extremities. Speech therapists will assess and facilitate treatment in communication, memory, problem solving and swallowing dysfunction. Cognitive rehabilitation techniques may be used to help people with memory and concentration impaired by a brain injury. These professionals identify needs for discharge, acquire equipment and identify resources to assist with transitioning patients back to the community. These professionals assess and treat cognitive impairment, psychosocial adjustment and develop behavioral coaching plans. The Rehabilitation Institute provides a monthly support group for brain injury survivors and families to provide ongoing psychosocial support and education to promote ongoing community living. Call 580-249-5533 for details. Watch stroke survivor Randy Caywood talk about his experiences at the St. Mary's Regional Medical Center Stroke Rehabilitation program. You can also read his story here. The Orthopedic Program at the Rehabilitation Institute treats people recovering from bone fracture, joint replacement surgery, multiple trauma injuries, arthritis, amputation, spinal surgery and other conditions. In addition, program staff work with adults who may experience balance problems caused by acute illness, arthritis, hypertension, sensory deficits, medication or depression. Following medical or surgical care, some people may be unable to climb stairs or walk across a room and may need to strengthen legs and arms before they can live on their own or are moved to a longer-term facility. The Rehabilitation Institute accepts referrals from physicians, nurses, other healthcare providers and patients or families. Whether you are a family member, a physician or another healthcare provider, contact us at 580-548-5001. Medical providers may fax clinical information to 580-548-5070.